*Update: This show starts this week & tickets are only available through Fri 4/12! Great spring break activity! Goldstar.com is offering discount tickets for the Cirque du Soleil Crystal show at the Angel of the Winds Arena in Everett, WA. They are offering discount tickets as low as $45 (Reg $55) – $74 (reg $91). The discount tickets are offered from Wednesday April 10th – Sunday April 14, 2019. We have not seen the Crystal show, but we did have a chance to see the Volta show last August in the Seattle area & it was incredible. I highly recommend this show as a fantastic show with friends or a date night, or it also makes for great family entertainment too! 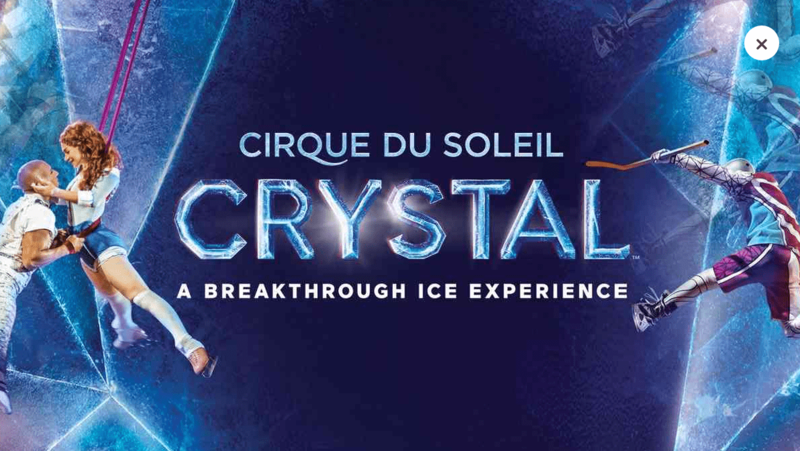 On a quest to make the world its playground — one surface at a time — Cirque du Soleil tackles its boldest terrain yet: ice. Glide into Angel of the Winds Arena in Everett and discover the surreal world of Cirque du Soleil Crystal, the company’s first production atop the glistening realm of frozen water. Watch in wonder as world-class ice skaters and acrobats challenge the laws of gravity, executing one electrifying moment after another as they tell the exhilarating story of a woman’s journey toward confidence, liberation and empowerment. Make sure you’re there as this spectacularly innovative company shatters the icy facade of reality to reach the sparkling world of possibility beneath.